When the original Apple Watch was first launched, it was thought of as an extension of the iPhone. While that was pretty much the case back then, now it has evolved into something more useful for users. Apple is marketing its wearable in a lot of segments. The smartwatch compliments the iPhone perfectly while also being one of the best fitness trackers on the market. 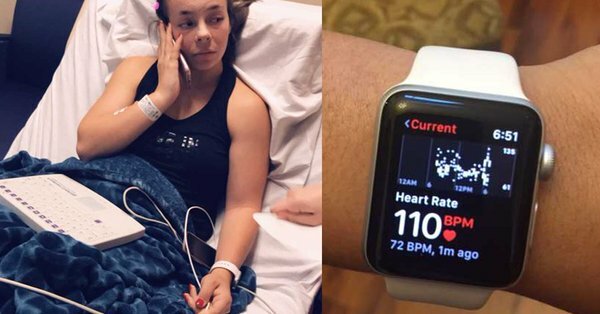 Now, it has come to light that the Apple Watch has helped save the life of a teenager uncovering a critical kidney failure. So let’s dive in to see some more details about it. The story comes from ABC News right out of Tampa Bay, Florida. Tim Cook, Apple’s CEO shared the story on Twitter as well on Tuesday saying that stories like this “inspire us to dream bigger and push harder every day”. According to the report, Deanna Recktenwald saw her heart rate jump from normal to 129BPM last Sunday. The teenager stated that her only symptoms at that time were shortness of breath and headache. With the information in hand, all thanks to the Apple Watch, Rectenwald’s mother Stacy took her to the nearest clinic just to be on the safe side. The clinic’s staff confirmed that the elevated heart rate and their visit to the clinic’s emergency room revealed a critical and chronic kidney disease. The teenager’s both kidneys were only 20 percent operational. “After rushing her to the emergency room, doctors at Tampa General Hospital soon discovered Deanna suffers from chronic kidney disease. It’s due to the Apple Watch that Stacy realized something might be wrong with her daughter. Henceforth, the smartwatch was ultimately credited for saving Recktenwald’s life. The notification detailed that medical attention was required and turned out to be a key factor. It’s good to see technology helping those in need before help is even required.